Welcome to my 300th post at Living Up to My Name. Over the past 4 years, I have been blessed to learn and share the stories of hundreds of Christian Athletes and the stories of how God has been at work in their lives. I look forward to continuing to share these stories as God uses them to teach me more about Him. 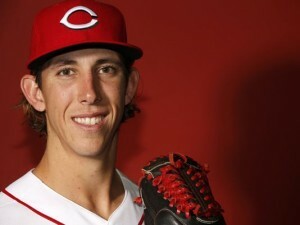 That being said, I’ve been struggling to write a post about a Cincinnati Reds player for the past season and an half. I didn’t write about any Reds player last season, and I didn’t know who to write about this year until last night. 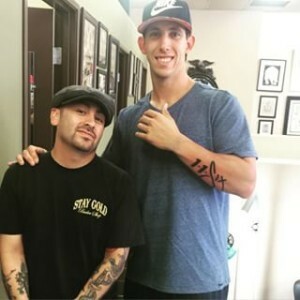 A twitter friend of mine told me that during last night’s Reds-Cubs there was talk about Michael Lorenzen‘s new tattoo which featured two number ones and the word “six”. Viewers learned that it was in reference to Romans 1.16, which says “I’m not ashamed of the Good News. It is God’s power to save everyone who believes, Jews first and Greeks as well.” Intrigued, I looked into the story, and learned a lot about the 23 year old rookie and his story. I also learned of a song and a blog devoted to the 116 movement. Here is the video from last night’s game talking about the tattoo. Has it ever! He flew through their system, working his way from Rookie league to AA ball in his first season as a pro. He spent last year in AA again, and started this season in AAA, but appeared in only 3 games there before being promoted to Cincinnati. He has appeared in 14 games this season, starting 12. His dependence on God and his desire to follow Him began in his troubled High School days. He was living as an entitled student athlete. He says “I felt like I deserved stuff because I was good at baseball.” Then, one night, everything changed. He shares in this story with Fox Sports “When I was 17, I was high on marijuana on a pier in Huntington Beach and some guy came up and started sharing about the Lord. It was so convicting for me. I thought, ‘Wow, I’m high right now — this guy, this stranger, is talking to me about the Lord. Crazy. It changed my life. To this day I don’t know the guy.” With his brother Matt, who had recently become a Christian helping him, Michael accepted Christ as his Savior. He had found purpose and meaning for his life. and everything changed. Now, with baseball as his platform, he knows he is not playing for himself anymore, but rather to honor God and share Him with others. In this video, we see how he sees baseball and his relationship with God as connected and important. Here are my takeaways from Lorenzo’s story. Lorenzen’s web-site is there to encourage us to read the Bible and apply it to life. 1- Living it Out – Lorenzen has started a web-site called “Infected Athletes” He says “The message behind it is just we’ve all been infected by sin and the cure is Christ and so, yeah, it’s just whatever I’m reading, whatever I’m studying at the time, I just kind of post what I learn and how we can apply it. The challenge is to apply it. Yeah, we can all read, we can all acknowledge a God, but the challenge, like I said, is applying the Word and living it out.” Lorenzen has gone to great lengths to connect with people to encourage them with God’s Word and how to apply it to life. I agree that study is great, but application of what you are studying/learning is the challenge for us to take up. The world has been infected by sin, but Jesus made a way for the sin to be dealt with. It is a great picture of God’s love. The story of redemption is shown in the logo. Read the meaning behind it here. Sin entered the world via a tree, and sin was dealt with by Jesus hanging on a tree. Cool! For Lorenzen, Living for God and helping others do the same is the purpose for his life. 2- 1-1-Six – I get to share Bible stories in many settings – VBS, the after school program I direct, my own kids, and other places in the community. But when it comes to situations outside of those comfort zones, it is tempting to stay quiet. Romans 1.16 is a great verse. God changed Saul’s heart turning him from arresting and imprisoning Christians to encouraging Christians and being imprisoned himself for his faith. He was bold and outspoken, sharing his faith wherever he went. That is the challenge for us. Remember who God is. Nothing is impossible for Him. There is no reason to be embarrassed or ashamed. If you are excited about what God has done for you and the grace you have received from Him. Share it wherever you go. He is worth it. He offers us a cure for our sin disease. Will you stay infected, or will you live life cured, carrying the antidote for sin to the world around you. That’s great that you were able to find a video clip of what I told you about. Glad that you were able to make an article about it too. Yes, thanks for the tip. I’m impressed that MLB put the video up the next day. That was cool! Awesome! Also, if you need another Reds player for another year, you might check out Skip Schumacher. He’s also in that Intentional Walk book that you mentioned in the Holliday post. I’ll keep my eyes peeled for more on that team. We get a lot of their games here in Indiana. kids need someone closer to their age to look up to! i knew there was something different about Michael Lorenzen when i first saw him and then at the first game i got to see him pitch heard his walk up song Our God id an Awesome God! i think that says it all!! i dont agree with the tattoo. The word of God says not to cut or peirce your flesh( Leviticus 19:20,corintians6:19-20).The tatto sends a mixed message.It is defenetly not the way you should express yourself about the word of God. Alexandra, thank you for reading and for your response. I know that the tattoo issue is one that is debatable. I got a tattoo 2 years ago after I saw God at work through a tragedy in my life. My tattoo has a bible verse and is a direct tribute to the comforting work that God is doing. As I read the last part of 1 Corinthians 6.20, i see my tattoo as a way that I AM honoring God with my body, by displaying the way He worked in my situation. As for Leviticus 19.28, my understanding is that the tribes and people groups surrounding the Israelites had as part of their religious beliefs and rituals to tattoo themselves in worship of their false gods. Just my thoughts from the other side of the argument. Thanks again for reading. I hope you continue to find stories on these pages that encourage you in your journey of faith as you follow our amazing creator. I came across this as Michael came in to a game today. 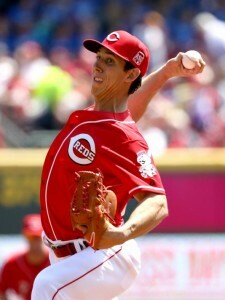 Googled “lorenzen pitcher tattoo” after seeing his left forearm. In addition to the 116 he must have some words tattooed along with it now. Thanks for sharing! Good catch. I just looked into it and it looks like there is a verse added, There is also an image of light breaking through clouds and 3 crosses. This tweet (https://twitter.com/lorenzen55/status/628570779911909376) shows that it says “I have been crucified with Christ. It is no longer I who live, but Christ who lives in me. And the life I now live in the flesh I live by faith in the Son of God, who loved me and gave himself for me.” (Galatians 2:20). Thanks for the information, I’m glad to update this information now.